Many of my close friends and family members are nurses, and I’ve noticed (via Facebook of course) that many recently celebrated National Nurses’ Week, which ran Tuesday, May 6 through Monday, May 12—the actual birthday of Florence Nightingale. Florence Nightingale is known as the founder of modern nursing, but you might not know that she is also a celebrated statistician. When I started reading more about her contributions to statistics, I was surprised to find that she used statistics to not only learn more about how many people died during wartime, and why, but also as a way to visually persuade people of the need for social change. The article “Florence Nightingale: The passionate statistician” by Julie Rehmeyer goes into more detail, but I’ve compiled some information below on how Nightingale pioneered the use of statistics to improve hospital conditions, save lives, and develop policy for sanitation reform. Nightingale was tasked to serve at a British hospital in Turkey during the Crimean War when reports got back to Britain about the horrific hospital conditions for the wounded there. 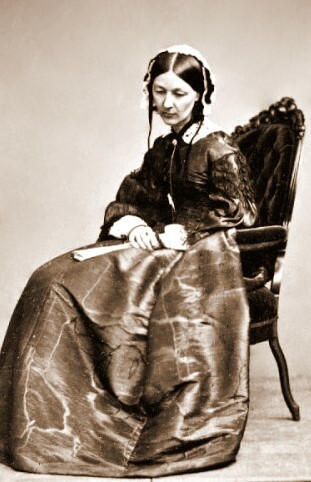 She and a team of volunteer nurses addressed many issues, such as an overworked medical staff, neglected hygiene, and short supply of medicines and food, and by the time they left Turkey after the war ended in July 1856—the hospitals were improved and death rates were reduced significantly. However, when Nightingale returned to Britain, she worried that what happened in Turkey would happen again if what was learned wasn’t acted upon in the future. She began to document her findings, including the medical data she collected while in Turkey, in a report that she hoped would help her to identify exactly why wartime hospital deaths were so high. She found her report in need of more significant statistical analysis, and joined forces with William Farr, the inventor of the field of medical statistics. 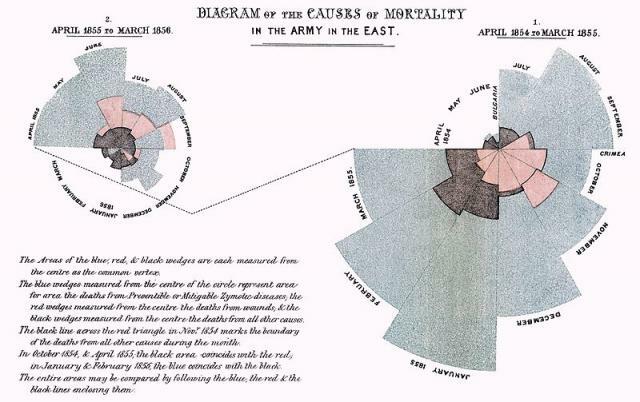 With their analysis, Nightingale learned that lack of sanitation was the main cause of death during the Crimean War, not the short supply of medicines or lack of food. She also discovered that in peacetime, soldiers in England died at twice the rate of civilians—confirming that military health service inadequacies were causing more damage than was previously thought. Sanitation reform was badly needed. The graph shows the number of army deaths that occurred from preventable disease (in gray), those that were from the results of wounds (red), and those due to other causes (black). The circles are divided by months of the year, and months with longer wedges have more deaths. For months during the first part of the war (see the coxcomb shown to the right), the gray wedges are largest. However, for months after March 1855 (see the coxcomb to the left), the gray wedges become smaller because this is when Nightingale and the Sanitary Commission started addressing public sewage, ventilation, etc. in Turkey. In the article, Rehmeyer brings up that others have suggested that a bar chart would have helped Nightingale make her point more “dramatically.” What do you think? Perhaps a clustered bar chart with colored bars for each cause of death (with month/year on the x-axis, and mortality rate on the y-axis)? Regardless of which graphical method Nightingale should or shouldn't have used to prove her point, I think it’s worthwhile to note the power of statistical analysis in promoting and persuading reform. After all, her analysis—and especially her graphics—led to widespread public sanitation and medical reform, which saved countless lives.